The Institute of Bioinformatics educates and prepares graduate students to attain mastery and leadership in bioinformatics research and its applications to contribute to the advancement of this new interdisciplinary filed. Graduate students pursue research-oriented programs of study leading to the Ph.D. or M.S. degrees. Graduate students matriculating in this program will be directed and mentored by faculty members from multiple departments and disciplines. The research in the Institute of Bioinformatics covers a wide spectrum of bioinformatics research in the areas of microbial, fungal, plant, and animal genomics, structural genomics, biomedical (e.g., cancer) genomics, glycogenomics, proteomics, transcriptomics, and pharmacological informatics, using computational, statistical, and experimental technologies. The overall mission of the bioinformatics graduate degree program is to train and mentor students as responsible scientists to join the work force of the biotechnology and pharmaceutical industries, private and government research labs, and academia. The institute offers Master of Science (MS) and Doctor of Philosophy (PhD) degrees. 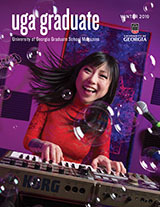 The major portion of the graduate degree involves dissertation research, typically specializing in one of many different areas of bioinformatics and related sciences. More details about the scope of this research can be found at our website: www.bioinformatics.uga.edu/research.php. The candidates for the bioinformatics M.S. degree program must apply to the Graduate School and meet its admission criteria for doctoral programs. Admissions decisions for qualified applicants will be made by a Graduate Admission Committee within the IOB with a standard consistent with those of the Graduate School. Information needed for the admission consideration include the GRE (Graduate Records Examination), GPA (Grade Point Average), three letters of recommendation, and a personal statement describing the student’s interest in bioinformatics. Successful applicants will be expected to have mastered one or more of the undergraduate disciplines that serves as a foundation for bioinformatics, such as biology, computer sciences, mathematics or statistics. Mastery will be demonstrated by course work equivalent to a major in an area. Applicants for the M.S. program in bioinformatics must have completed two semesters of calculus or the equivalent. While in the program, students will fulfill all the requirements for the Graduate School for the M.S. degree. Student progress in the program will be monitored by the Graduate Coordinator and the IOB Graduate Affairs Committee. Upon arrival at the university, students will be assigned a curriculum advisor for guidance and mentoring. Because this program is interdisciplinary, students will be advised to take prerequisite courses in areas where the student does not have the necessary background. Students will select their major professor and establish an advisory committee by the end of their first year in the program. The major professor must be a full member of the IOB and the Graduate Faculty. The advisory committee must consist of the major professor and at least two other faculty members. At least two members of the advisory committee must be full or associate members of the IOB. The advisory committee will also be composed of representatives of both the biological and the quantitative sciences. For the thesis option, the student is required to take an oral examination conducted by the advisory committee and to have his/her thesis approved by the committee. For the non-thesis option, the student will prepare a technical report in a research project in bioinformatics under the direction of a designated full member of the IOB faculty. The technical report must be approved by a committee of at least three full members of the IOB, including the project director. This committee will be appointed by the Graduate Coordinator.